Welcome back to the Findex, an in depth look at the fish and coral life in the sea. Here we will take a look at the fish that everyone will see while they are diving but maybe don’t know much about or don’t get as much time in the spotlight as the big stuff! Today’s fish is the apple of the eyes of many photographers keen to snap it in its juvenile stage. 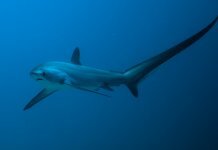 The adults are also great to see and can often be seen in big shoals around the reef, both in mono-species groups and with other fish. The Harlequin Sweetlips, also known as the Clown Sweetlips, Spotted Sweetlips or Harlequin Grunt, are members of the Haemulidae family. This is a huge family of fish also referred to as the Grunts which includes over 133 species. They get the name grunt by being able to grind their jaws, making a grunting noise both in and out of water. The Harlequin sweetlips gets its name from its bright spotty pattern, like that of a court jester. The scientific name, Plectorhinchus chaetodonoides is made up of two parts – ‘plektos’ meaning plaited and ‘rhyngchos’ meaning snout. This refers to their large fleshy lips that have many folds up their snout. The last part means that it looks like a Chaetodon, the family name for butterflyfish. This refers to the flickering swimming pattern of the juveniles, flitting around the reef like a butterfly. 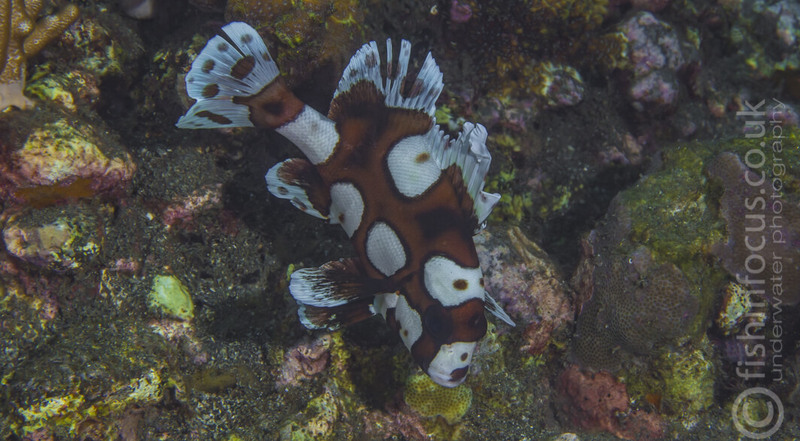 Harlequin sweetlips can be found throughout the Indian and Pacific Ocean regions from Mauritius to Samoa. 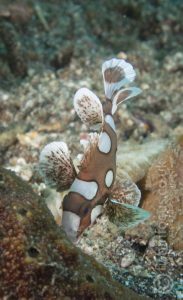 They keep themselves fairly close to the reef and are rarely found much deeper than 30 metres, but can sometimes be found in shallow lagoons and brackish estuaries. When they want to spawn, they do so offshore in large numbers. They are broadcast spawners, meaning they release eggs and sperm into the water to mix and drift on the current. This is what it’s all about! The juvenile fish are some of the most beautiful little fish you can find on the reef. They are often around 10cm and are a pale, caramel brown with bright white spots down its body. They swim around in an undulating motion, flitting and bobbing around in a seemingly random motion but there is a purpose to this. They are camouflaged to look like a poisonous worm or nudibranch to deter predators. As they grow the colours change completely. The young adult stage starts to show more of its white background with large chocolate brown spots all along it. It really looks like the fish is rusting! This stage does not last very long so snap it while you can, in fact it was only due to observations in public aquariums that we know of this stage at all. The full adult stage looks different again, with a dark cream body and very small brown and black spots. Both male and female fish look very similar and it is very difficult to tell them apart from each other in water. Adults can grow up to around 70cm and can weight up to 7kg. After hatching the larvae grow very slowly, putting the species at risk of over fishing. Experts believe that it can take up 14 years to double the size of the population so care needs to be taken when fishing it, either for food or for the aquarium trade. The two different life stages of the Harlequin Sweetlips lead quite different lives. 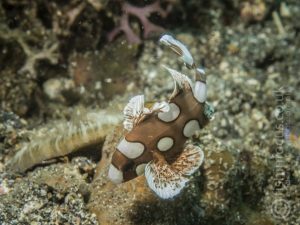 As mentioned earlier, the juvenile fish mimics a poisonous nudibranch or flatworm. It swims in a dance like pattern and is stunning to watch and film. They swim face down, moving their fins in opposing circular movements. They are usually stay close to the reef, in amongst the branches of the coral to avoid predators. During this stage they eat small shrimps and larvae that come close to them. Adults are fairly inactive during the day as they are nocturnal hunters, eating small crustaceans, molluscs, worms and small fish. Rather than sleeping in a crevice or on the sand they sleep swimming. They can be found hanging out under outcrops, near overhanging rocks and inside caves and grottos. They can often be seen in small groups of just Harlequins or in larger groups that can include other species of sweetlips. I have seen these guys on most of my dives in the Philippines and the Great Barrier Reef. They are a real pleasure to watch doing their little dance, and if you have the good fortune to see two of them hiding together the display is like a flamenco dance team. It takes some time to get that shot mind, as they are constantly moving, but it is worth hovering silently next them and waiting for the perfect opportunity. Keep your eyes open for them when you are doing your critter hunts or muck dives. The adults are also a great complement to a large, reef wide shot. I have found they tend to hang out with the Yellowbanded sweetlips, Plectorhinchus lineata, and the Oriental sweetlips, Plectorhinchus vittatus. These are more yellow and have stripes rather than spots but as a shoal they are a sight to behold. Juveniles can be approached slowly and they will continue to dance and mimic, only hiding away if approached very quickly. Adults are indifferent towards divers, allowing you to swim among them quite happily. We travelled to the Philippines and stayed at the Atlantis Resort in Puerto Galera to see these fish. It was always nice to see the adult fish around the reef and swimming through a shoal of them has a certain magic about it. But I love seeing the juvies, they never fail to put a smile on my face and I am more than happy to spend time watching the dance and waiting for the time to snap the perfect photo. It’s also great to show them to people and see them observe them for the first time.